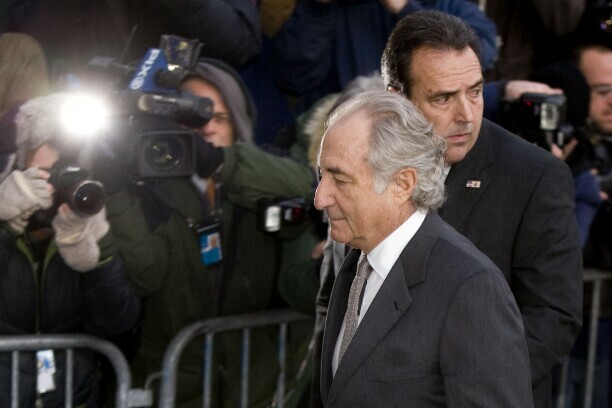 Bernard Madoff is escorted into federal court in New York on March 12, 2009. Victims of Bernie Madoff’s Ponzi scheme convinced a federal magistrate judge April 11 that their class action against the attorney who represented them belongs in federal court. The investors sued Becker & Poliakoff LLP and Chaitman LLP alleging attorney Helen Chaitman improperly represented clients with competing interests while at the two firms. The case is properly before the federal court under the Class Action Fairness Act and shouldn’t be dismissed, Magistrate Judge James L. Cott wrote in a report and recommendation. The case stems from the liquidation of Bernard L. Madoff Investment Securities LLC. Chaitman represented both net winners (who received more funds from the scheme than they invested) and net losers. “The more money collected from some of her clients (the net winners), the more available to be distributed to her other clients (the net losers),” the suit alleges. The two firms moved to dismiss, arguing the court lacks jurisdiction. But the court agreed with the investors that CAFA applies. The suit meets CAFA’s requirement of more than 100 class members because Chaitman’s website boasts that she represented about 1,600 Madoff customers, the court said. The firms couldn’t explain why this statement should be disregarded, it said. The suit also meets the $5 million amount-in-controversy requirement based on the attorneys’ fees the firms made from the cases alone, the court said. The fees amount to almost $6 million. That amount doesn’t include the plaintiffs’ other potential damages, the court said. The parties have 14 days to object to the magistrate judge’s recommendation. Judge Victor Marrero oversees the litigation. Engstrom, Lipscomb & Lack and Stalwart Law Group represented the investors. Kaufman Borgeest & Ryan LLP represented Chaitman LLP. Wilson Elser Moskowitz Edelman & Dicker LLP and Lewis, Brisbois, Bisgaard & Smith LLP represented Becker & Poliakoff LLP. The case is Shulman v. Becker & Poliakoff, LLP, 2019 BL 129821, S.D.N.Y., No. 17-CV-9330, 4/11/19.